George Webb is an iconic Milwaukee Hamburger joint. George Webb would predict the Milwaukee Brewers would win 12 games in a row. That predictions somehow became through word of mouth, if the Brewers win 12 games in a row they would give out free hamburgers. 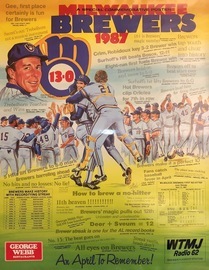 That never happened until 1987 when the Brewers won 13 games in a row. Even though the restaurant never officially said they would give out free burgers, they stepped up to the lore in April of 1987. This commerative poster showcases that event. George Webb stepped up again in 2018 when the Milwaukee Brewers won 12 games in a row and offered free burgers to all.